Because the Expedience Solution is built directly on Microsoft Word, you can take full advantage of all the collaboration features of Microsoft Word, from the latest multi-authoring functionality of Office 365 and Word 2016 to the well-established but still very indispensable function: Track Changes. Microsoft Word 2016 marks a tremendous advance in bringing the Web to the Desktop and providing Web-based collaboration while preserving the full functionality of Microsoft Word. 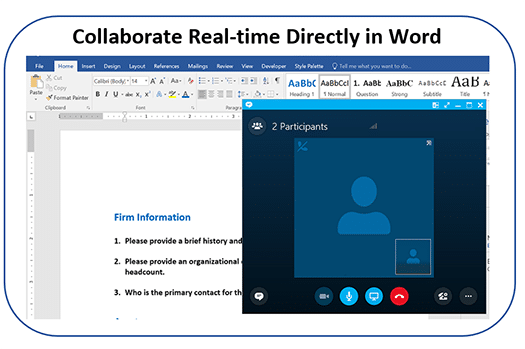 The Expedience Solution supports robust collaboration directly in Word using SharePoint, OneDrive, and Office 365, as well as any collaboration platform that supports MS Word. Despite the many advances in multi-authoring in Office, email is still one of the most common methods by which proposal writers make content requests to their Subject Matter Experts. 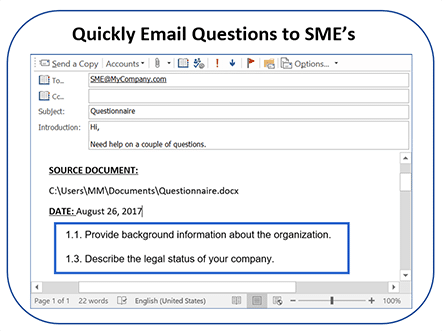 The Expedience Content Portfolio provides a ‘Quick Email’ feature to send selected questions to your SMEs.